With a view to showing the variety of work that we get involved in at Shaw Gibbs Insolvency & Advisory, this case study focuses on a project that we took on earlier this year. For purposes of confidentiality, we have had to change the names and have deliberately not mentioned the product of the actual case. However, we hope this account still illustrates the value that our team of insolvency and corporate recovery experts can add for clients and, in this instance, demonstrates that Insolvency Practitioners from competing firms can work together very successfully to protect their client’s interests. This tale involves an individual who is an absolute genius in their own field of expertise, we’ll call him Fred Bloggs. Fred developed a unique product that very, very slowly became the focus of interest from competitors. He was not a marketing guru and so the business grew slowly by word of mouth but having attracted some interest from competitors a deal was done whereby, a bit like a Dragons Den’s ‘take it or leave it deal’, our client sold 75% of their business to a much larger company that had a raft of other subsidiary companies, each of which specialised in a different area of the trade in which Fred was involved. Being a little naive our Fred had not instructed independent advisors and had signed the shareholders agreement that had been put in front of him. 25% of all future profits. He had signed within the shareholders agreement a ‘follow on‘ agreement under which, if the incoming 75% shareholder sold their shares, our client had no alternative but to agree to sell his shares on the same terms if a new purchaser wanted to buy 100% of the shares of the company. Fred Bloggs, being a bit of a guru, happily continued doing what he does and the ‘Fred Bloggs’ product grew in status within the industry. In fact, the relationship between our client and the 75% shareholder blossomed over several years until unbeknown to our client some of the other companies in the group started to suffer a bit of financial distress. Fred never really understood the management accounts he received but money flowed into his bank account on a regular basis so he never worried but when the accounts started to arrive late and payments into the bank started to be missed the relationship started to go awry. Short circuit to a year or so after the first signs of trouble appeared, Fred received notice from a firm of Insolvency practitioners that the top company in the group had been placed in administration and that the administrator was trying to sell the 75% shareholding in Fred Bloggs Limited (FBL) as an asset of the top company. Suddenly nobody from the top company would talk to Fred and all he was told by the main director that he dealt with was; “don’t worry it will all be alright”. How did Shaw Gibbs help? At our first meeting we went through the latest set of accounts that our client had, reviewed the shareholders agreement and tried to understand the group situation. It quickly became apparent that FBL had consistently made profits but in the 18 months leading up to our first involvement; money had been diverted from FBL to the parent company leaving FBL with a massive loan to the top company, Large Company Limited (LCL), that was unlikely to be repaid. FBL were also left with massive debts to their suppliers, arrears due to HMRC and a production facility that would have to close if emergency funding could not be sourced in order to pay wages and keep suppliers happy. On top of this, the banks were threatening to appoint administrators over FBL – the same administrator that was already dealing with the top company. We quickly got on the phone to the administrator (A) who agreed to a meeting a few days later, where we all sat down to discuss the situation. A’s position was that he did not think it was a good idea to place FBL in administration and that he had persuaded the bank to stay their hand for 14 days. He wanted to sell the 75% shares that he had control over and he wanted our clients help to pull together the sale pack documentation. He did not threaten our client with the terms of the ‘follow on’ agreement but he made it clear he understood the power that it gave him to sell 100% of the shares if he so wished. What he did say was that he thought that any purchaser would be interested in talking to our client given his expertise and he wanted our client’s help to maximise the value of FBL. ‘A’ was certainly correct in his assessment that there would be serious interest from potential purchasers to acquire the shares of FBL. He was also correct in his view that it was unlikely anyone would be interested in an asset only purchase as, in the industry in question, insolvency is viewed extremely harshly by most of the key suppliers. Over the ensuing couple of weeks we, together with our client, met with half a dozen or more of the potential purchasers and guided A to focus on those that our client felt happy to work with in the future. Discussion from our client’s point of view focused on how the future working relationship would work, what security was being offered to our client, and how his 25% shareholding would be viewed. Finances for a sale of the top company’s 75% stake were carried on with A. A also persuaded two of the potential purchasers to put up £100k each to finance continued operation of the production facility and buy in essential supplies whilst negotiations were progressing. The outcome was that A sold his 75% shareholding for an undisclosed sum, before receiving £0.5m by way of share capital injected into the business. This sum cleared the unsuccessful purchasers’ £100k, paid off HMRC and made a substantial, one-off payment to FBL’s suppliers to get them back on board. Our client as part of the process saw their shareholding diluted but were repaid all arrears of salary and a loan made to the company at the time of the deal with the top company. The shareholders agreement was also renegotiated with our client, restoring the intellectual property for the original product they had designed and created as well as giving them back control of their name with FBL allowed to use the product and name on a license. In the event of FBL going into insolvency in the future our client will be a free agent. Other key personnel from the previous top company have also transferred to the new owners, bridges have been mended and relationships rebuilt. This is a prime example in our view of the innovative and imaginative way that insolvency practitioners can work at speed to help distressed companies rebuild. We think, in this case, that the creditors of top company and our client are lucky to have engaged practitioners who not only understand the needs of their clients but also had empathy for everyone involved and therefore could steer their way through difficult situations to get to a solution that achieves an acceptable outcome for all parties. Our client accepted the need to surrender some of his shares to help A secure not only a good price for the creditors for whom he was working but also the half a million share capital investment needed to save the company. A was able to recognise that trying to bully our client by threatening to use the ‘follow on’ agreement would alienate a key employee of the company and undermine the value of his shares as without our client on board very few of the purchasers had a serious interest in the business. Shaw Gibbs now has three Insolvency Practitioners and a larger, experienced team in position to help in all situations that involve or touch on insolvency or corporate recovery. 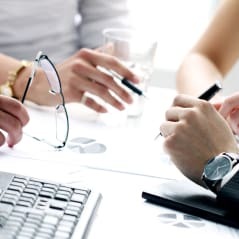 We also have the back up of one of the largest accountancy and business advisory practices in the Thames Valley and London to help advise business on a whole host of matters including; tax planning, accounts and audit, corporate finance, and financial planning - all of which were utilised at some point in the above case. Furthermore, Shaw Gibbs' membership of the DFK international network provides further support in cross border situations with different jurisdictions.